When financial investors and traders look to develop their skills and look to take advantage of more and more investment strategies, it often can be overwhelming and stressful. This is where automated trading systems come in to play. This allows computers to monitor and execute trades on behalf of the trader. Automated trading, also known as robotic trading or algorithmic trading, has become the primary means of trading due to its ease of use and reduced human error, making up about 75 percent of all market trades, according to a report from earlier this year. In this article, we are going to do a quick review of what automated trading is, as well as some of the essential benefits. If you have followed our blog in the past, it is likely that you already know what automated trading or algorithmic trading is. For those who aren’t aware of what an ATS is, basically, it is an algorithm designed to follow specific rules set by investors. Automatic trading software gives investors and traders the ability to fully automate their trading strategies, executing trades based on the strategy. Once a strategy has been selected by a user, the market is monitored to find profitable buy or sell opportunities based on the specifications of that strategy. 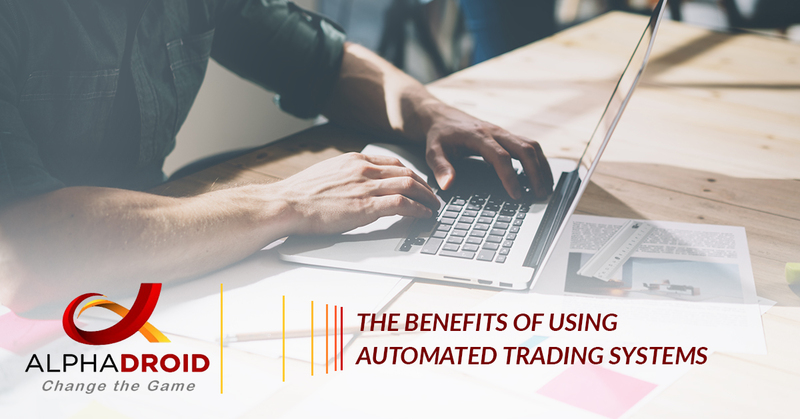 Let’s take a look at some reasons why adopting automated trading systems could be the route to finding the perfect solution for your investments. There are a plethora of benefits to getting into automated trading. Below, we highlighted some of the most essential benefits of algorithmic trading systems. If you have done any trading you likely know that a lot of the decision you make as a trader involves emotions such as fear, greed, and regret — all of which can ultimately hurt profits. By keeping emotions in line, traders generally have an easier time sticking to an established trading strategy. Since trade orders are automatically executed once the trade rules have been met, traders will not be able to hesitate or question the trade. Plus, in addition to helping traders ‘pull the trigger’ on certain shares and assets, algorithmic trading also helps traders who tend to overtrade — buying and selling at each and every opportunity available. Backtesting applies trading rules to historical market data to determine the success of a certain trading strategy. While attempting to backtest a manual trading strategy poses a series of challenges, it is not an issue with automatic trading systems. Traders that backtest strategies over a long period of time will provide them with invaluable insight into whether or not the chosen strategy has been successful in the past. The information and data revealed in backtesting is vital to the success of your trading strategies, however, it is important t to forward test the strategy as well to confirm that it is still making money and still has the edge. You can do this by applying your strategy to a simulation account where real money and assets are not at risk. One of the biggest challenges in financial trading is to stay consistent. Even if a trading plan has the chance to be profitable, ignoring the rules alters any expectancy the system would have had. There is no such thing a perfect trading plan, or a plan that profits 100 percent of the time — losing is part of the game. Because profit losses can be psychologically traumatizing, a trader who has two or three losing trades in a row, for example, may decide to skip the next trade to avoid further losses. But if this next trade would have been a winner, the trader has already destroyed any expectancy the algorithmic trading system had. With an ATS, the emotion of trading is removed, and instead the system focuses on consistently executing a strategy as planned regardless of winning or losing trades. Automated trading systems permit the enable a user to trade multiple accounts or strategies at once. This creates the potential of spreading risk over a variety of instruments while creating a hedge against losing positions. What would be incredibly challenging and time-consuming manually is executed efficiently by a computer in milliseconds. The system is able to scan for trading opportunities across a wide range of markets, generate orders, and monitor or track trades. Active traders are known to spend hours monitoring market movements and positions. During this time, traders use their knowledge and skills to implement their trading strategies which can be very time-consuming and will allow them to only monitor a limited amount of strategies. With an ATS, users can build as many strategies as they want to do the work for them. However, it is monitor the algorithm’s to make sure they are working as expected. These are just a few of the many benefits of using an automated trading system. If you are interested in trying algorithmic trading there isn’t a better-automated trading software than AlphaDroid. To learn more about AlphaDroid algorithmic trading strategies and portfolio management software, try a free trial today!